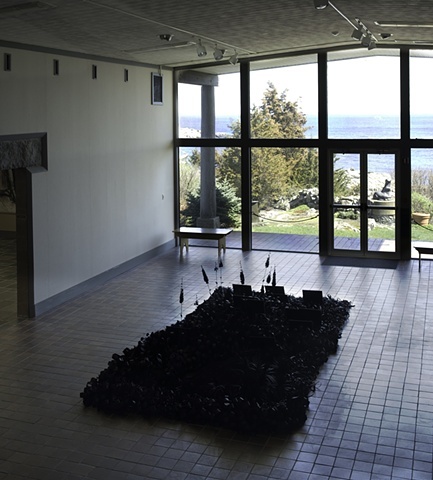 Installation at the Ogunquit Museum of American Art, Ogunquit, Maine. Only appearances are fertile; they are gateways to the primordial. In 1969 artist Robert Smithson traveled the Yucatan peninsula with a tourist guide and twelve 12 x 12 inch mirrors. Along the way he created nine mirror displacements – temporary works of art in which the mirrors were momentarily integrated into the landscape. Smithson documented his ephemeral installations in a series of photographs and the essay “Incidents of Mirror Travel in the Yucatan.” (published by Artforum, 1969). My installation Incidents of Garden Displacement is partly inspired by Smithson’s journey. Here, a natural landscape is replaced by a meticulously crafted field of paper flora. As with Smithson’s mirrors, this collection of botanical forms can be installed at any location in response to the shape and use of that space. The resulting garden is a new site that is not rooted in the earth but in culture. While Smithson sought to create work that evoked timelessness, Incidents of Garden Displacement draws deeply from relationships with a historical past and present.